Hello, it’s Kati from Houseful of Handmade. This week it officially became winter at our house! It started snowing Sunday night and we woke up to 8 inches Monday morning. Our family loves the snow so everyone woke up super excited. The kids couldn’t wait to get outside. They played so much in the snow, we needed to make sure we had something to warm them up when they came inside. 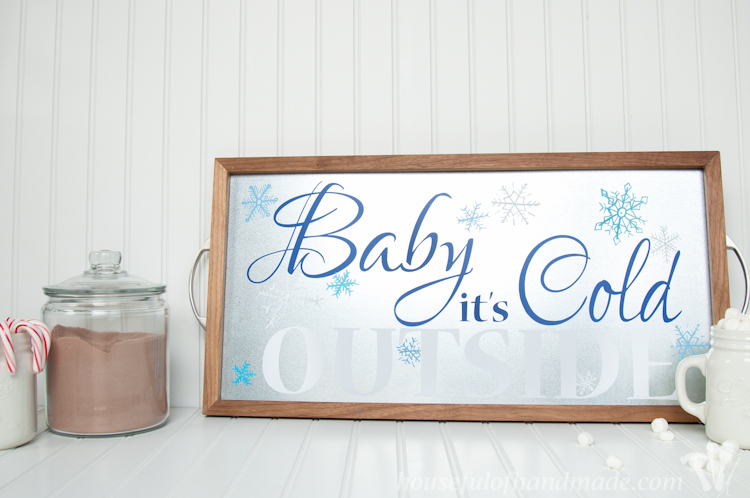 It was time to finish up our hot cocoa and coffee station and this beautiful Metal Winter Sign from DIY Tray is the perfect decoration for the season. The snow is still piling up outside. My kids have been going out to play 3-4 times each day this week. They just can’t get enough. So it’s necessary to have a hot cocoa station for them to warm up when they are ready to come inside. On our shelf in the dining room we have our cocoa mix, with some peppermint candy canes and marshmallows for the perfect winter treat. To make the cocoa station more of a statement in our dining room, I needed some décor. In October, I made a beautiful Wood & Steel Serving Tray. It was easy to make with some hard wood 1×1 boards and a piece of sheet metal. 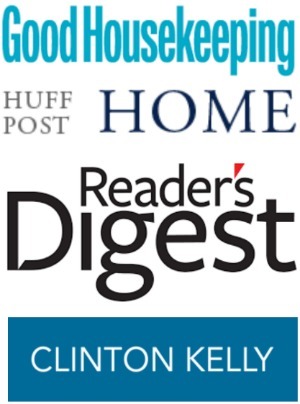 It is great for serving as well as décor. I used it for my Thanksgiving centerpiece, filled with rustic pumpkins and rosemary. Now I am ready to use it to decorate another way. I have a little love affair with metal & wood these days. The hard metal with the softness of wood is the best of both worlds. I used it to create my Reclaimed Wood and Metal Christmas sign and figured I could use the same idea on my tray for decoration in the dining room. The steel is the perfect canvas for creating art on. It is non-porous and can be written on like a chalkboard. 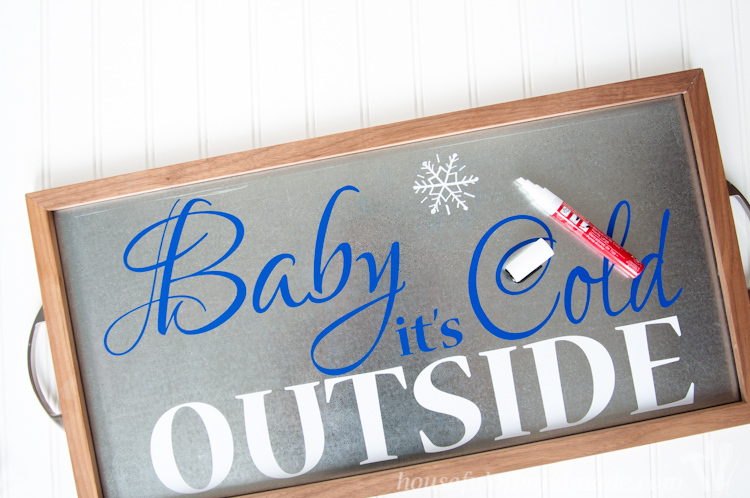 You can draw on the steel with chalk markers or even dry erase markers. I, however, am not so good with the hand lettering. I keep trying and one day I will have beautiful hand written words, but until then, I used my trusty Silhouette to cut out some beautiful, hand drawn inspired, words out of vinyl. 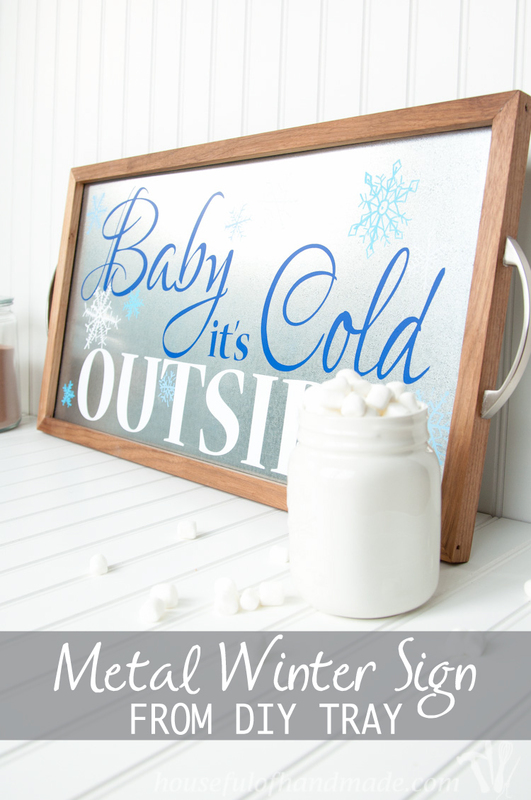 If you want to create your own Metal Winter Sign from DIY Tray, I have included a Silhouette cut file for the lettering. If you don’t have a Silhouette, I am also including PDFs of the lettering so you can use it as a template for hand drawing. 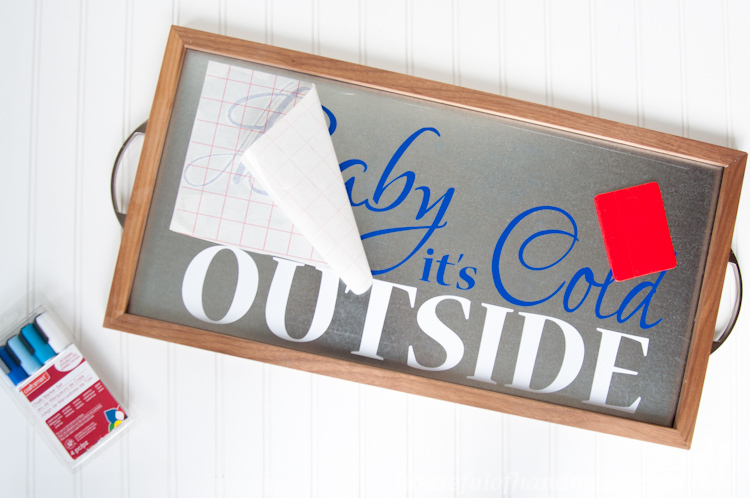 Adding the vinyl to the wood and steel tray is super easy and it isn’t permanent so you can change it up whenever you want, or remove it if you need it use your tray for serving. After I got the vinyl placed on the tray, it was time to add a little flair. 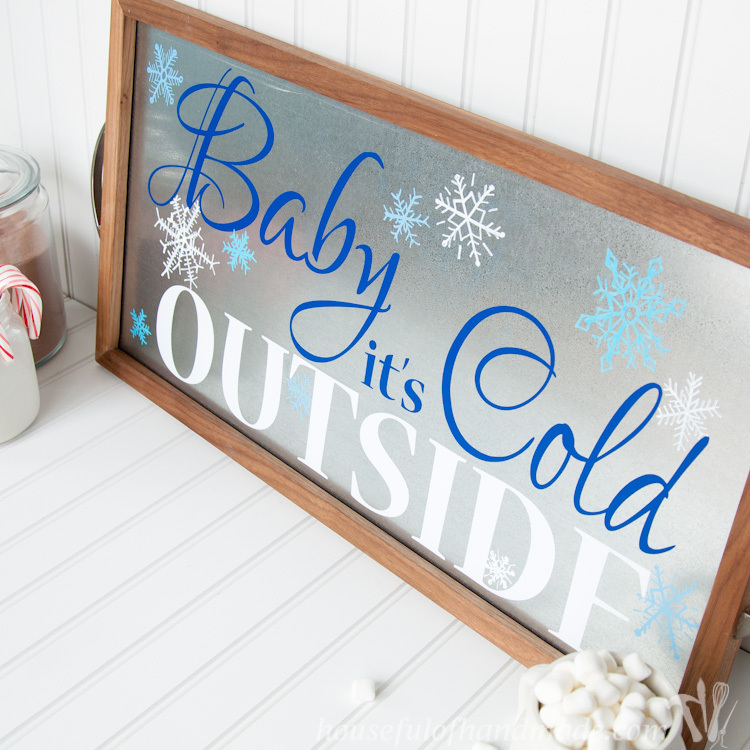 What is a “Baby it’s Cold Outside” sign without snowflakes? I am great at drawing snowflakes, and they are suppose to have lots of uniqueness so hand drawn is perfect. I used chalk markers in white, and 2 different shades of light blue to fill the tray up with lots of different snowflakes. Snowflakes are easy to draw. They’re suppose to have 6 points (scientifically speaking), so I always start with 6 lines then add some flair. I love adding lines in geometric patterns and a few diamonds or circles. Now the sign is ready for sprucing up our cocoa and coffee station. Add some hot cocoa mix, your favorite mix ins, and you are ready to stay warm. 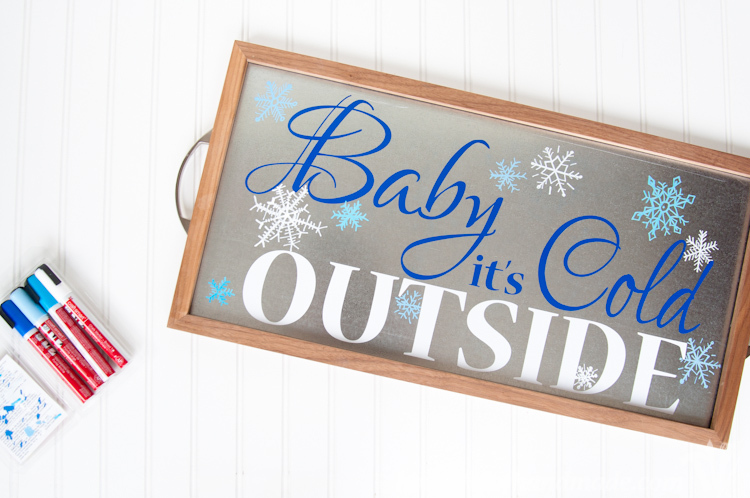 If the snow keeps coming down like it has been all week, I will be able to use this sign as décor until April, because baby, it’s cold outside here! For more home decorating ideas, make sure to visit me at Houseful of Handmade. I’ve been having fun getting my home ready for the season. 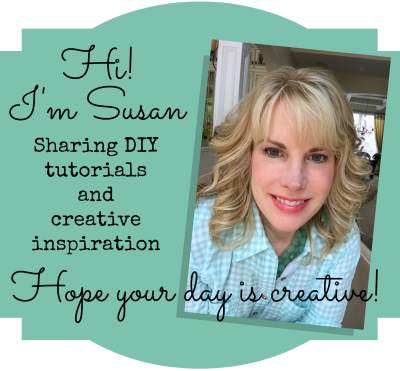 I’d love for you to follow along with all my crafting and creating adventures at Houseful of Handmade. 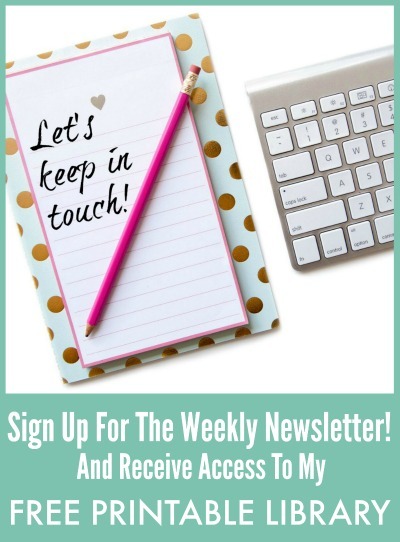 You can also find me on Facebook, Instagram, and Pinterest to see my latest projects and snippets of our fun (and a little crazy) life! This is adorable! I love everything about it. Thanks so much for the tutorial and the cut file. I just got a Silhouette and love to come across these different projects. It really get inspired!